It’s not easy to get people to open your cold emails. They don’t know you. They might not know much about what your company does. Or why your product or service could be the perfect solution for their biggest pain points. So, why should they spend their time reading an email from a stranger? How can you convince your contacts to click – and maybe even reply? Even if your copy is perfect and the offer is irresistible, it won’t matter unless you can get your leads to open and read your cold email. 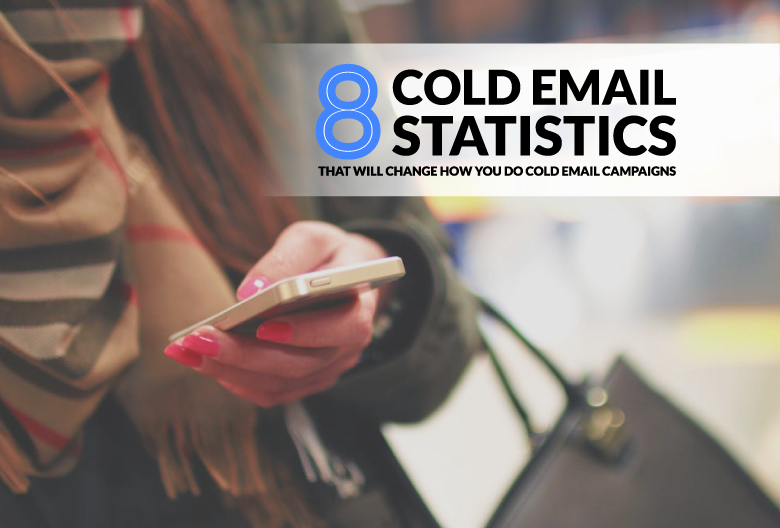 We’ve compiled these cold email statistics to give you a benchmark of successful cold email campaigns. Hopefully you’ll learn something that can be applied to improving your own campaigns and entice your contacts to see what you have to say. 1. Including the recipient’s name in the subject line can increase your open rate by 22.2%. It doesn’t take much effort to add the recipient’s name to an email subject line, yet the results can be quite impressive. In fact, a bit of personalization in an email subject line can boost your cold email open rate by 22.2%, according to a report from Adestra. So, even if you don’t have an original, creative subject line idea, you can grab your leads’ attention by customizing the subject to each recipient. Something as simple as including the prospect’s name in the subject can make your message stand out in their inbox and compel them to click. 2. Depending on your industry, average email open rates vary from 15.22% to 28.46%. 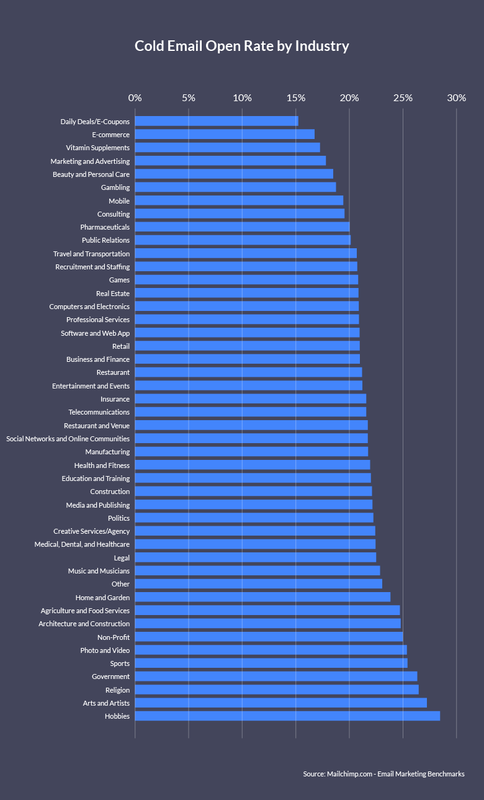 What’s the average open rate for your specific industry? If you’re comparing your own results to other industries or companies targeting different types of customers, you’re not getting a clear picture of how your campaigns are actually performing. Data from MailChimp indicates that average open rates for email campaigns range between 15.22 and 28.46%. While emails from businesses related to hobbies receive more opens than any other industry, daily deals and e-coupons have the lowest open rate. Why is this important for you to know? So you can create realistic goals for your next email campaign and use your specific industry’s average as a benchmark. 3. A/B testing your subject line can increase open rates by 49%. When LeadGenius wanted to improve their email open rate, they tried a number of different subject lines and tracked their results along the way. Their original subject line was simply “Your Sales Process” and had a 37.5% open rate. By the end of their cold email experiment, they’d increased their open rate to a hearty 86.6%, thanks to a much more personalized subject line (“I found you through [Contact First Name] [Contact Last Name]). That said, this type of subject line might require more of an outreach strategy overhaul to help you get in touch with the right people who have the right connections for your business. 4. 35% of recipients open emails based on the subject line alone. According to Convince and Convert, over a third of email recipients decide to click on email based solely on the subject line. That means a winning subject line can overshadow the fact that the recipient doesn’t know the sender – thereby cancelling out the biggest cold emailing challenge in 35% of cases. So, if you want to make a better first impression and get more of your leads to actually open your emails, the trick is to write more effective cold email subject lines. 5. Targeted cold emails result in a higher open rate than average. The average open rate for business emails sits around 14% to 23% depending on the industry, according to ConstantContact and MailChip. However, creating a highly targeted list (combined with personalization and the right subject lines) can increase your open rate significantly. For instance, a story on FastCompany highlights a cold email experiment conducted by Shane Snow (cofounder of Contently) and Jon Youshaei (founder of EveryVowel). They sent out 1000 emails to the busiest people they could think of – high level execs at successful companies. They tested out different subject lines, email lengths, and messaging angles. In total, 293 messages bounced. But of the 707 emails delivered successful, 45.5% were opened. That’s a pretty impressive open rate, especially considering the type of people on their list. One of the biggest takeaways from their experiment? Personalization, researching your contacts ahead of time, and developing a highly targeted list are among the most important indicators of cold emailing success. 6. Short, attention-grabbing subject lines receive more replies. Snow and Youshaei also found that brief subject lines designed to pique recipients’ curiosity result in more responses. The two types of subject lines they experimented with were short and vague (“Quick Question”) vs. long and specific (“15 Second Question for Research on Annoying Emails”). The results were similar for both subject lines in terms of how many emails got opened. However, there was a notable gap between the number of responses each subject line received. The short and vague subject line (“Quick Question”) received 66.7% of the total replies, while the more detailed subject line only received 33.3% of replies. The lesson here? Your response rate can be improved dramatically by modifying your subject line - especially if you can spark your recipients’ interest. 7. Email personalization can increase your reply rate by 100%. Want to get more responses to your cold emails? The good people at Woodpecker found that personalizing your emails with custom snippets can double your reply rate. 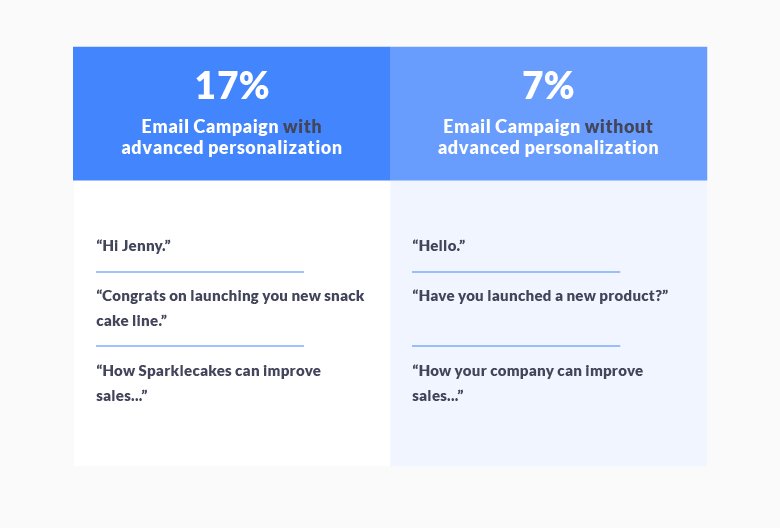 Woodpecker examined their own cold email campaign results and found that emails with advanced personalization garnered a 17% reply rate, compared to a 7% reply rate for non-personalized emails. So, what constitutes advanced personalization? It’s anything that shows prospects you did you research and are writing directly to them, rather than sending out a mass message. This means going above and beyond cold email basics (things like greeting the recipient by first name and mentioning their company name). Whether you congratulate them on a recent product launch, refer to something to you read in one of their articles, or compliment their sizeable social media presence, try to include a few custom snippets that speak directly to your lead as an individual. You’ll grab their attention, flatter their ego, and likely get a fair number of responses. 8. Sending more follow-up emails can triple your reply rate. Whether it’s via phone, email, or social media, failure to follow-up enough times is one of the cardinal sins of sales. With cold email campaigns in particular, the number of emails in a sequence affects how many responses you’re likely to get. In fact, in one example, campaigns with 4-7 emails per sequence received 3X more responses than campaigns with only 1-3 emails in a sequence. The campaigns with longer sequences had a reply rate of 27%, compared with the shorter campaigns that had a reply rate of 9%. If there’s one thing to learn from the cold email statistics above, it that’s cold emailing is tricky but rewarding if you take the time to do it right. Make sure you have the right tools (including a robust CRM platform) to track, measure, and improve your results with each cold email campaign.